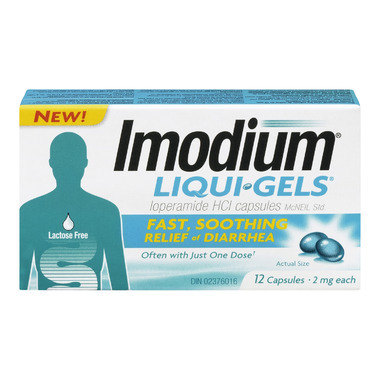 IMODIUM Liqui-Gels provide you with the fast, soothing relief of a liquid to settle things down and restore your feeling of harmony. This gentle, yet effective solution is perfect for all bouts of diarrhea. Dosage for Adults and Children 12+: Take 2 capsules (4 mg) initially and 1 capsule every time you have a loose bowel movement, to a maximum of 8 capsules (16 mg) per day. Stop use if you have a solid or hard stool or if you go for 24 hours without a bowel movement. IMODIUM products are not recommended for children under 12 years of age except on the advice of a doctor. Nonmedicinal Ingredients (alphabetical): FD&C blue No. 1, gelatin, glycerol,propylene glycol, propylene glycol monocaprylate, soya lecithin, triglycerides and water. Works fast! I would recommend this product.